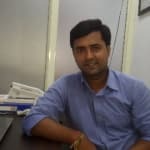 Dr Deepak Singh Choudhary is a Orthodontist (The Braces specialist ) & Cosmetic/Aesthetic Dentist in Bairagarh, Bhopal and has experience of 5 year in these field. He mainly works on aesthetics of the patients and their smile line & curve. He completed MDS - Orthodontics & Dentofacial Orthopaedics from Modern Dental College And Research Centre, Indore in 2015, BDS from Peoples Dental Academy, Bhopal in 2011. He is a member of Indian Dental Association and Indian Orthodontic Society. He provides excellent dental care to enhance the quality of your smile. He provide a complete dental care, with all latest equipments and providing expertise services in his dental-clinic. My teeth are yellow and I do not even smoking. Even though my teeth are not good, I also do brush. So how can my teeth are healthy and good. It may be because of gums bleeding. You can consult me through Lybrate for homoeopathic treatment. Till then start using heclalava toothpaste by wheezal. I am 32 Years Old. And I am Suffering with Ulcer from 2 months. Please give the Solution. Avoid hot and hard food. You can apply local anesthetic gel to lesion 4-5 times daily, specially 10 minutes before meal. Do gargle and mouth wash with water. Just spit off the gel with saliva. Take green vegetables, citrus fruits and healthy food. Keep hydrated yourselves. If same ulcer is persisting since 2 months, immediately meet dental surgeon. Hi sir I have a dental issue as last 6 year ago I used to ache on tooth but it comes in each 6 month whenever I take bite of food from this tooth it gets ache for 7 days so I avoid to take food from this and it's also giving pain to other tooth which connected with that so what should I do is RC is the only option but it's took expensive and painful so any solution? If you don't want to go for RCT then you may try taking homoeopathic treatment.... it may relieve the pain.. Or you may have to exctract the teeth..if it there is caries. I am not able to feel any taste of whatever I am eating. This is happening since last 20 days. Also my mouth and tongue burns whenever anything mild spicy I am eating. Without eating also there is continuous burning sensation in the front of tongue. Tongue is whitish in colour and I try to scrap the white layer but it does?t go. I am using candid mouth paint since 2 weeks but no improvement .Can anyone help what should I do? You seem to be having vitamin deficiency along with fungal infection. Take a b complex tablet along. Also you get anesthetic gel for very painful lesions. Consult a ENT surgeon. when I wake up after sleep then I found my mouth full with water. Please suggest me what is the reason. 1. Sleep on your back sleeping on your back is a good idea because it helps saliva settle right at the back of your throat, which eventual drains down. It is a good idea to tuck yourself in so that you don't change side while sleeping. Start sleeping on your back and you will notice a substantial improvement in your condition. 2. Prop your head up propping your head up may also help when sleeping at night. Propping yourself in a vertical position will help keep your mouth close, which will prevent drooling. Bad Breath - Know Homeopathic Remedies For It! Consult your dentist may due to tension or vitamins deficiency or local factor are responsible for ulcers. Hello sir mere niche Vale dant k masodo m bahut jyada chiss si ho rahi h mene Dr. ko dikhya to vo sujan bta rahe h or scaling bta rahe h use krvane m koi peresani to nahi h.
It is safe n needful. Go for scaling and polishing of teeth. Use mouthwash twice daily after brushing. Maintain proper oral hygiene. For whiter teeth and preventing them from discoloration, muching on foods like apples, carrots, pears or celery after brushing is effective as they induce tooth-bathing saliva which whitens the teeth. 1. After 1st sitting is completed, temporary filling is given so be gentle in chewing from that side whithin that tooth as it is quite brittle. 4. If your tooth was in pain prior to treatment, it may take few days for tooth to heal pain to be relived. 5. If your tooth was not in pain prior to treatment, your tooth may be quite sore for a few days after appointment, this soreness/pain will relieved with time, it may take as much as seven-ten days. 6. Take medicine on time complete the course, if you stop taking it your tooth may become infected.